Do you avoid smiling because you are not happy with the appearance of your teeth? Do you avoid meeting new people because you are afraid of being judged by the state of your teeth? If so, you are the perfect candidate to benefit from cosmetic dentistry. Anacapa Dental Art Institute in Oxnard, Ventura County is a full service dental practice specializing in improving the beauty and function of each patient’s teeth so they can smile with complete confidence. While cosmetic dentistry is focused on improving the appearance of the teeth, the procedures additionally correct dental defects such as overbite and underbite and many other structural problems. Anacapa Dental Art Institute uses the latest equipment available so that our world-class dentists and technicians can provide our patients with restorations and other cosmetic enhancements all in one location. From simple teeth whitening to full mouth restorations the goal is to provide our patients with the convenience of receiving treatment at a single location staffed with friendly, caring professionals. Thousand Oaks residents are fortunate to have an outstanding cosmetic dentistry clinic within easy reach. Whatever the need, our highly skilled dentists can improve the appearance of your smile even if it has been many years since your last dental visit. Our patients are delighted to find their fears and concerns are completely understood so that they can relax and know they will soon be rid of a condition which has limited many of their lifestyle choices. At Anacapa Dental, we are delighted to see our patients with big smiles, confident that they can be comfortable in social situations which they have been avoiding. 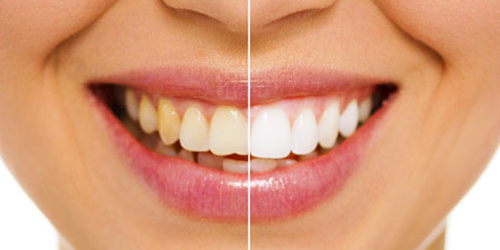 One of the easiest and most commonly requested smile enhancement procedures is bleaching. Bleaching discolored teeth can remove years from the appearance simply by restoring a level of whiteness that is associated with youth. Teeth can become discolored from different causes including reactions from medication, aging and heredity. Wine, smoking, certain foods and certain medical conditions also contribute to dull, yellow teeth. If you want a quick boost of confidence, this is a good way to start a rejuvenation program on your teeth. Teeth can be whitened at home or in the office. Home whitening is usually preferred and consists of using custom made trays that fit the teeth so the chemical whitening agent can remain in place for a specified time. In office whitening can be a good start to a whitening program. 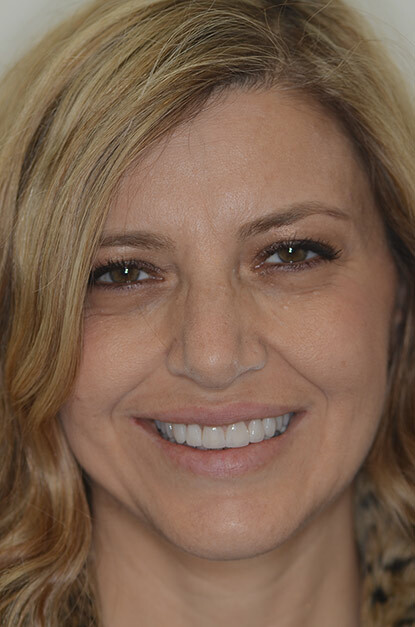 In just an hour or so, the front teeth can be whitened several shades immediately with the balance of treatment taking place over the next few weeks at home. As we age, our teeth can be damaged by the erosion caused by certain foods, sports injuries, falling or car accidents. There are several treatment options available depending on the scope of the work to be done. Anacapa Dental Art Institute is able to offer the highest caliber of cosmetic dentistry Ventura has available. This ensures our patients receive the latest technology for the prescribed treatment. Porcelain veneers, bonding, crowns and dental implants all require an extremely high level of skill for long term success. While overbite, underbite, and crooked teeth may be unsightly, these conditions are actually more of a problem with function. Teeth that aren’t functioning properly or that are so crowded that dental hygiene is compromised are a health concern. Patients with misaligned teeth and problems with their bite can also suffer from jaw pain, headache and other ailments not to mention the restriction on food choices that many patients make to compensate for being unable to properly chew their food. Having a strong beautiful set of teeth allows us to enjoy the simple pleasures of eating an apple, talking and laughing with friends or going to a steak house. Cosmetic dentistry in these cases provides a two-fold benefit; straight and properly aligned teeth that are fully functional and teeth that no longer cause embarrassment or distress. Modern dental technology has provided a way to restore a full set of functioning teeth even in cases where bone loss or injury has compromised the root foundation. Dental implants can restore one or two missing teeth or both arches of missing teeth. If you have many missing or decayed teeth proper restoration will be a life changing event. At Anacapa Dental, we pride ourselves on providing among the best cosmetic dentistry Oxnard and Thousand Oaks residents can find particularly in the area of restorations. Another exciting option which replaces bridges and dentures is called All-on-4. In this procedure, the restoration arch is anchored on four implant posts which eliminate the need for traditional dentures. This is a new technique that our dental team has successfully done with many patients who may not have good bone density or who want a faster and lower cost solution to wearing dentures. Do You Want A Million Kilowatt Smile? A beautiful smile is a valuable asset for many reasons, both professional and personal. Find out how cosmetic dentistry can help you correct any dental flaws so you can smile with confidence. Call today for a consultation. Top tier cosmetic dentistry for Thousand Oaks and Oxnard residents is close and convenient. Having a smile to be proud of begins with calling for your first appointment. 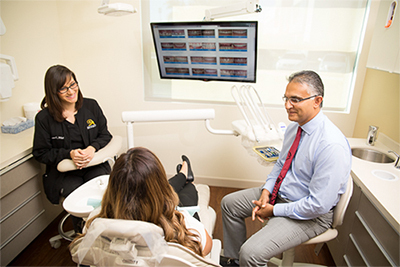 Before any treatment takes place, you will first meet with Dr. Saj Jivraj and his expert staff at the Anacapa Dental Art Institute in your own private consultation. The goal of this meeting is to establish what you would like to attain in your treatment, what imperfections you would like to resolve and, of course, to meet our compassionate staff in order to understand why we are considered one of the leading dental offices in Ventura County. Please call us today to schedule your consultation.